The current occupant of the White House may have withdrawn the traditional invitation to the Golden State Warriors following their victory over Lebron James and the Cleveland Cavaliers, but that didn’t stop the Bay Area ballers from visiting with a U.S. President this past week; it’s just the one they met wasn't orange. The team instead had a not-so-secret rendezvous with former President Barack Obama during their recent stop in the nation’s capital to play the Washington Wizards. The get-together took place on Thursday at the former President’s office in Washington. The gathering reportedly included players and members of their security team, but sources on both sides are officially playing coy about the event. The visit was originally revealed in a team staff member’s Instagram post that was later deleted. According to ESPN’s Ramona Shelbourne, a team official informed her that the visit was arranged by star guard Steph Curry. 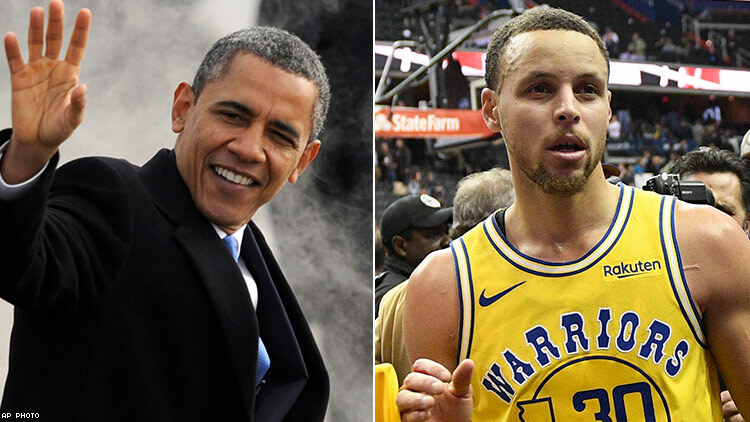 Obama and Curry developed a friendship following the team’s 2015 visit to the White House celebrating the Warrior’s first NBA Finals victory since Rick Barry and Jamal (then Keith) Wilkes upset the heavily-favored Washington Bullets back in 1975. The Warriors have not been shy to express their displeasure with President Donald Trump, particularly his much-publicized spat with Colin Kaepernick and habit of denigrating the intersectionality of sports, race, and advocacy. Coach Steve Kerr, who won three NBA Finals rings as a player with Michael Jordan and Scottie Pippen on the Chicago Bulls plus an additional two titles alongside Tim Duncan on the San Antonio Spurs, has been particularly outspoken in what he sees as the excesses and dangers of President Trump. Kerr’s own father was gunned down while working as a professor at the American University of Beirut in 1984. As a result of their spat, Trump either withdrew a previous Warriors invitation to the White House or never issued one, depending upon which side is to be believed. Former President Obama, of course, is a renowned gym rat. His legendary 5-on-5 pick-up games were a who’s-who of basketball junkies and wannabees from the sporting, celebrity, and political worlds. It was not uncommon to see the likes of Hall of Famer Pippen posting up the then-Secretary of Education Arne Duncan. Friends and coaches from his high school and college days describe a player who was both athletic and cerebral but without a steady long or mid-range jumper. Mike Zinn, former athletic director and basketball coach at Occidental College told the Los Angeles Times in 2008 that Obama was a slasher and hard-nosed defender who wasn’t afraid to mix it up under the basket or dive after loose balls. Reports indicate his outside shot has improved in the decades that followed, but he still only shoots with his left hand and isn’t that great driving to the right. There has been no word from either President Trump or the Warriors organization about any invitations to the White House should Golden State capture their third straight title and fourth out of the last five. Chances are they’ll probably bypass the offer if extended. It seems there’s more than one President, current or otherwise, available to meet with this year’s champions. And only one of them can go left.